Barbara Lal, a scholar of sociology, knits a captivating story around the lack of choice of everyday items. She uses the example of something as basic as footwear to explain how the scenario has changed over the years. There was no choice. Because basically when you went to get chappals, for example, you went out to Janpath and they had a shop which had chappals. But they were old regulation kind of chappals. The very basic ones. And supposing you wanted something other than that basic chappal, like a boot because it got cold in Delhi, you would have to go to the Chinese (boot maker). Because the Chinese boot maker was the only one who would make you a boot. You know, a wonderful made to order boot. But it was outrageously expensive and certainly well beyond the ability of any reasonably, even middle class Indian I would imagine, to afford. They were outrageously expensive. So now, when you go down to Janpath or when you go to Khan Market, there are so many shops to buy chappals of all kinds and they are not outrageously expensive. And you find people who are buying fashionable shoes. You couldn’t just assume you lived in a society which had things to consume. They just weren’t there. And you know, you could say, yes but you know, you had these wonderful sarees that were being made in the village and you had clay cups and stew and you had these wonderful terracotta cups which were then tossed away. You don’t have them anymore and they were really wonderful. They were sanitary, smelled wonderful. But people obviously didn’t want them more than they wanted glass or pottery or whatever. So there is a tendency to be romantic about the fact that people built these little bonfires on the street during the winter, they had those braziers under their blankets; you could smell this wonderful charcoal, you could see these people walking majestically with their braziers. You could see them on bicycles coming down the roads because there were very few cars. That is a very romantic vision. I mean it has its appeal but I don’t think most people who were actually carrying the braziers, who were on the bicycles actually, I think they were probably happier taking a bus and by the way the buses at that time, the buses looked as if they were about to fall over on their sides. So you had the feeling of, if you can avoid a bus. 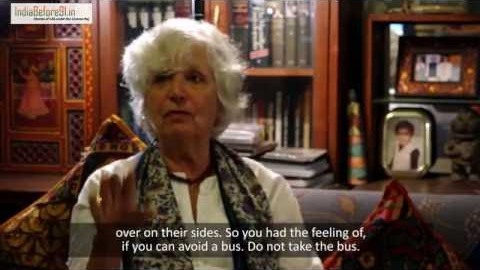 Do not take the bus. So people who live now probably can’t imagine the kind of different, totally different cultural and economic landscape that prevailed and you know, how people really lived these constrained lives, and of course the emergency was terrible. So when people compare Modi to Mrs Gandhi during emergency you have this feeling of “what”? You know, the courts are still functioning here, habeas corpus still functions. But people have a very short memory I think.